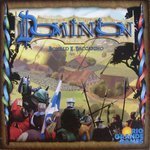 We are putting together our first Dominion tournament. The tournament must have a minimum of 8 players. We will be playing cards from the original base game. On the day of the tournament both players and cards will be selected at random. Come in to register no later than Saturday, October 6th. Please Note: We will be closed for a few days next week from Sunday (9/23) to Weds (9/26). We will be back in the store at normal business hours Thurs morning at 10am.